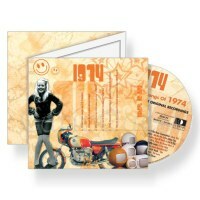 1974 A Time to Remember Greetings Card and 20 track CD. 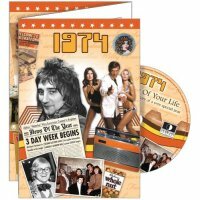 Perhaps the most unusual and treasured gifts around - 20 Original hits from the year 1974, presented on a CD and mounted in a quality 3-part, gate-fold, GiftCard, complete with envelope (GiftCard, CD, and white envelope, are all sent in a protective outer). 10. The Intruders - (Win, Place Or Show) She's A Winner. 15. The Drifters - Kissin' In The Back Row Of The Movies.